After many months of practice, tonight was the night of the Loudoun County "All County Chorus". Eddie has been practicing for this concert for quite some time, and it was finally time for the big performance. 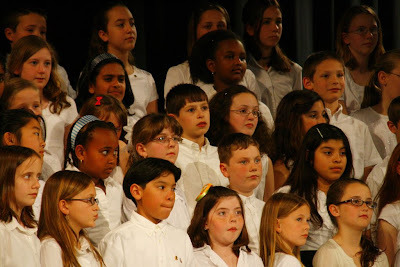 There were more then 170 kids in the chorus, chosen only from the fifth graders of every school in Loudoun County (of which there are something like 50 schools). Smaller schools like Lincoln and Aldie were allowed to send in two or three students from their fifth grade classes, while larger schools like Eddie's could send up to five kids. We were thrilled that Eddie had the opportunity to be a part of this chorus. Yesterday, the kids were bussed to Loudoun County High School to practice with their conductor, Dr. Deen Entsminger, who teaches music in Richmond. Dr. Entsminger worked so beautifully with the kids. He was so funny and so dynamic, the kids just loved him! They practiced all day Friday, from 9am until 5pm--a very long day for these kids. Then, today, on Saturday, they practiced some more, from 8:30am until concert time. You'd think they'd be tired, but they were bouncing after the performance! It was amazing what these kids accomplished. They've been practicing on their own at home and in school for a while now, but to be so crisp and so together--well, it was just amazing. Eddie was so happy with the performance, and he was just beaming about how cool Dr. Entsminger was. Eddie was also thrilled that Mrs. Verdile, his music coach, was able to see his performance. Two of Eddie's friends from Mountain View made it to the chorus: Sydney and Rachel. Plus Sharon and Desi's son, Eoin, and one of the boys from our church, Chris, also made the chorus. Mrs. Verdile remarked how nice it was to see so many boys in the choir. The kids sounded just awesome. But you can hear that for yourself. I've selected my four favorite songs from the night. Here are Jazz-Man, Gloria Tibi, Don Gato, and a piece written by Dr. Entsminger, Heart of Matter. After the concert, we took the boys to Red Lobster to celebrate. Eddie had a 12 ounce grilled rainbow trout, and the rest of us had Alaskan crab legs, shrimp, Maine lobster, and calamari. Yum! The kids did a great job! (It was nice to use it as background music while I did FSA billing! It took the edge off something I detest doing!) You can tell the kids really worked hard to bring it all together. must have missed this post. I loved performing in this chorus!! I had a blast practicing!! !